For people who visit this page – it was written a long time ago. The requirements to run Steam on Slackware are a lot lighter nowadays! Most important: PulseAudio is no longer required! All you need is a package for OpenAL (to play audio) and flashplayer-plugin (in order to watch the videos in the Steam Store). If you are running 64-bit multilib you will also have to create and install “compat32″ versions of the 32-bit OpenAL and flashplayer-plugin packages. It was august 2012 when I wrote an article about the viability of commercial games on Linux. 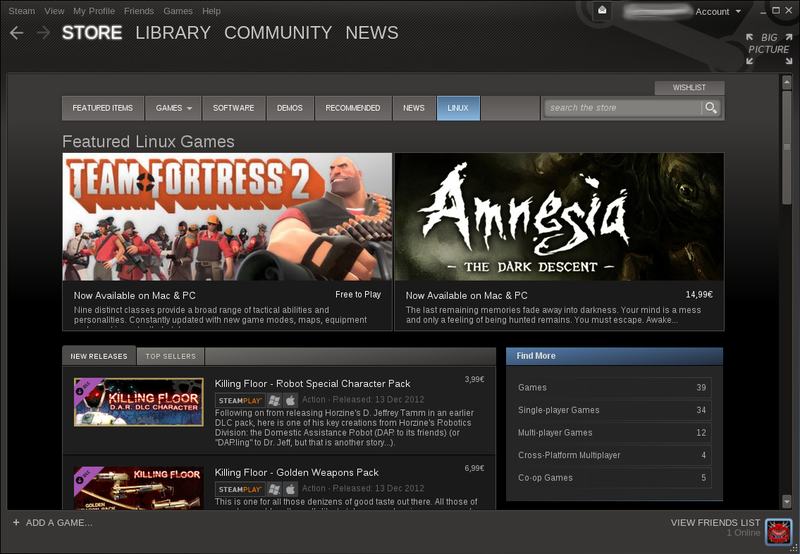 In particular, I was talking about the new Steam client for Linux which Valve Software was developing. Read that article now if you have not seen it yet, it will give insight as to where I stand with regard to the use of commercial software on Linux. 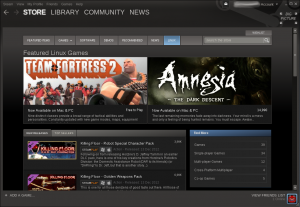 It took a while, and then Valve opened a limited Beta for their Steam client, inviting 1000 users at random, but targeting users of the Ubuntu distribution for obvious reasons: Valve wants to create a firm foothold in Linux now that they have “officially” denounced Windows 8 as a platform for which they will develop their software and games. Gabe Newell’s criticism of Windows 8 is well-known by now and in October of this year, Valve issued a similar statement during the Ubuntu Developer Summit. And Ubuntu has the biggest potential user base for game fans – let’s face it, more people move from Windows to Ubuntu than to Slackware, so commercially Valve is doing the smart thing. When the Beta program kicked off, people found out relatively fast that the Steam client had limited functionality, even for people who were not part of the initial beta. I quickly hacked together a set of instructions based on the tests I did. on Slackware, the package ships with a slightly modified steam startup script. 64-bit Slackware you must add multilib capability to it first. Slackware's ALSA for audio output. Pulseaudio will not be used. start Steam and play a game using open source drivers. I have added the required dependency packages (including those required for multilib) in a separate “deps” directory of that steamclient package. Note that my old hacks of creating a symlink to the “/sbin/pidof” binary and exporting several variables is no longer needed, the steam start-up script does all of that now. Installing the steamclient package, will get you a “Steam” icon in your desktop menu. Alternatively you can type “steam” in a terminal to start the client.You will see it downloading updates first, and then it allows you to connect to your Steam account. When you are connected to your Steam account you will see the Steam Store and a “Linux” menu which is exclusive to the Linux client. You can of course do anything (purchases, community chat etc) which you would also do in the Windows client or the web interface. You can then check out your own virtual “Library” which will contain the games you have purchased or which you could add because they are free to play. 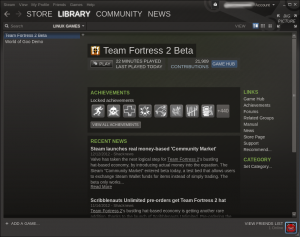 The Linux Beta shows two games here, the “Team Fortress Beta” which is an online shooter and “World of Goo Demo”, both of which are free. This tells ALSA to use the first “hw” device available. The default value for AUDIODEV is “default”. Posted: 16 December, 2012 in Games, Slackware, Software. Thanks Eric – works great! Except that I have not yet received a beta invite. I can wait, though. Interesting. Not sure if I’ll use the Linux client, since I can’t use pulseaudio–it’s not recommended for real time/low-latency computer audio work. Plus all the games I own via Steam are Windows/WINE. I’m more inclined to go the route of Humble Bundle for Linux-native games. I’ll definitely toss more money Steam’s way, though. I like supporting people who support Linux or are Linux-friendly. I’m currently running the Steam beta on Ubuntu 12.04, but it’s not exactly my favorite distro, so when I get home I will install Slackware instead and give your packages a whirl. 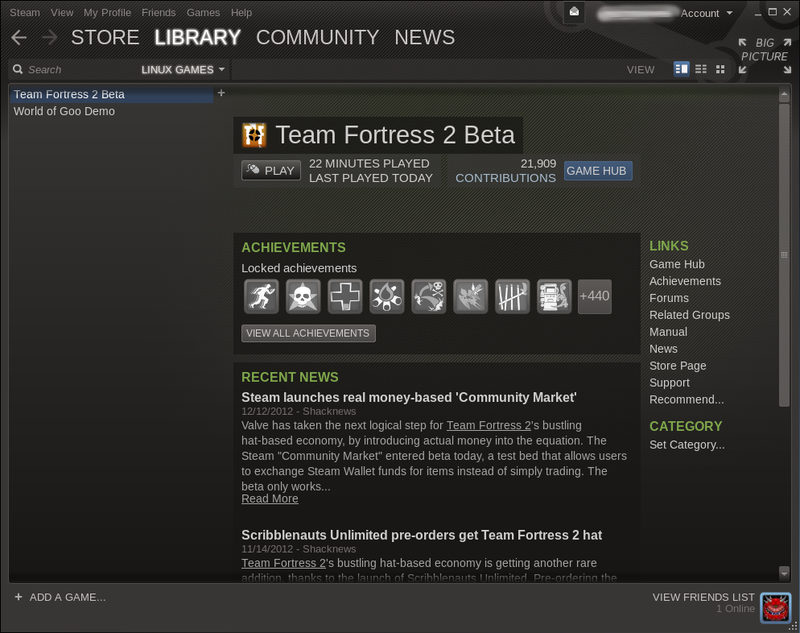 And yea, playing TF2 natively on my Linux box is just plain amazing. Times sure have changed. Yeah, it could be start of something really great. 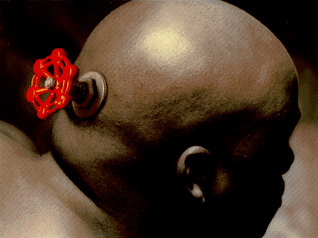 Great work Valve. And Eric for package and modifications ofc. First of all, congrats on your job Eric. Although I ain’t running slackware on my lappy anymore, I can assure you Steam here runs pretty well on my Intel HD 4000 GPU. I’ve got a minor issue, which I’m not sure is due to Slackware or the Steam application: I can’t create shortcuts to games on the desktop. Steam tells mere there already is a shortcut, despite the fact that there are none. The only desktop icon there is is for Steam itself. Other than that all seems to work pretty well. I get a “Fatal Error: Failed to load steamui.so”. Alan, that is a very sparse error report. Try to find out a little more. Check that you actually re-installed your proprietary Nvidia or Ati video driver after installing multilib packages for instance, because that is a much-occurring issue. Do i understand it right that if i got an slackware64-14.0 installation then i need to first install multilib and then the deps to make steam work? The pulseaudio is the one thing that makes me wonder if i should install it or not. How will the pulseaudio affect my slackware install? Will pulseaudio affect my future compiling and will it be used by my slackware install? Pulseaudio is something that i don’t want to use. hey Eric, please check out http://b.agilob.net/error-clgetplatformids-1001/ – might need to use google translate from polish to english but its about the same problem i’m having.. the problem is, the fix is for ubuntu obviously and i dont have a /etc/OpenCL/ – please any tips, thank you! I saw a few people coming to my blog, from here and I saw the post below, with the link to b.agilob.net to the post in Polish, so I translated it. I am using Slackware64 with multilib/compat32. It is due to note that when using the Steam client, not only do you need to make sure you have the compat32 for the listed packages but apparently, as you will obviously use a 3D capable graphics card like on my box, I use an Nvidia GTX460 but using the nvidia-kernel and specifically the nvidia-driver slackbuild scripts, you need to edit your build script to enable compat32 as well, otherwise you will receive a glx render error, which will cause issues with performance. I know it sounds ridiculous to be so specific but some users are still new to Slackware. That’s all I wanted to add other than Thanks for this site, your scripts, packages and information. People like you are hard to come by, so people like me appreciate you. Using Slackware64 and Steam also requires the 32bit Adobe Flash Player plugin, so I just made and tested out a flashplayer-plugin-compat32 package. 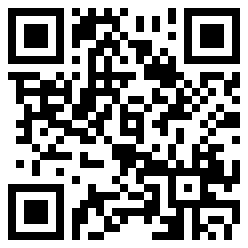 I have libflashplayer.so in both standard 32bit and 64bit lib directories. Firefox only shows one version of flash and the preview movies in the Steam store for games work great. hi i am linux fresh ,i do that follow your blog and ,when i run steam it show missing libc.so.6,could you tell me how to fix it ?thank you ! Can you please create a post on LQ: http://www.linuxquestions.org/questions/slackware-14/ ? Your question is too vague, a lot of questions need to be asked to find the cause of your issue, and the LQ forum is better suited for troubleshooting. Thanks for the SlackBuild. I’ve been enjoying Steam on my Slackware 14.1! I have the nouveau.conf set with “EXAVsync” and “GLXVBlank” set to “true”, but I only did that to correct video tearing, I don’t know how it affects gaming. Obviously, the more graphic intense games seemed to fair poorly. All of these games run fine on my Mint 13 system with proprietary drivers. I’m actually impressed. I think the Nouveau drivers have gotten much better. For people who visit this page – it was written a long time ago. The requirements to run Steam on Slackware are a lot lighter nowadays! Most important: PulseAudio is no longer required! If you are running 64-bit multilib you will also have to create and install “compat32” versions of the 32-bit OpenAL and flashplayer-plugin packages. i have the mesa-8.0.4-i486-1.txz installed, i need install the mesa-8.0.4-i486-1alien.txz ? Did you ever read the README.1st file in that same directory? ERROR: ld.so: object ‘/home/cristian/.local/share/Steam/ubuntu12_64/gameoverlayrenderer.so’ from LD_PRELOAD cannot be preloaded: ignored. It seems that this is an ALSA related issue. My Slackware 14.0 32 bit version has ALSA 1.0.26. Some suggestions were to increase buffer size or decrease sound quality during game but none of these options work. I also installed OpenAL package and the problem still persists. Is this an ALSA bug or a Steam bug? Anyone who has a solution for fixing this problem?